Former WR and WR coach Shiel Wood is coaching the secondary. If we are not getting Coach Mance back. They should be looking for a formidable replacement. Mark and Tom, another great job. Gay is one sweet back; that's why his YPC is so good. Ayers having a lot of fun for an old guy. Wahrby, a little extra face time here. It amuses me how Mark records the introduction for the IWF/terriervision broadcast after the game. We do our best to record the open before the game starts. Obviously it was a very busy weekend for Wofford. Women's Tennis home tournament, Volleyball last Southern Conference game in Ben Johnson Arena, and Men's Soccer hosted a post season game at Snyder Field. Chattanooga's IWF open will be recorded before the game this week. As well as VMI. But yes, there are a fair number of times that we do not get to record the open until after the game is over. It's all good. Good edition this week. Thanks! It was a good edition and the quality has improved greatly this year. I merely said that I was amused by the fact that Mark is squinting in the late afternoon sun for the 1:30 game. Thanks - esp to Walliver, T-Dog, LawDog (who comes to the UFFP site at times I think) and WocoSix who didn't beat me up about the loss. Good luck v Chatt ! So you are at Chatt this week. that's a big game! nice.. Congrats on putting yourself in that position for a big game. All we have to play for is pride Good that you are in the conversation. 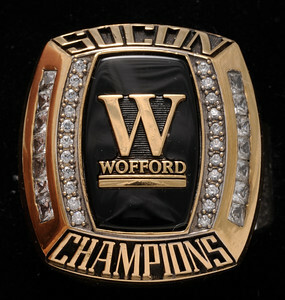 I don't see how they could deny an 8-3 Wofford team w a win over Chattanooga a shot in the 24-team playoffs. That would be a lock I think. Where it gets dicey is if you lose to Chatt... captain obvious here. Obvious or not, that's how it probably is. 7-4 ? Not sure.. You guys probably know better than me as you are the ones keeping up. Then you probably leave your fate in others hands? Or am I way off? The trouble I see w 7-4 is that age old question of 'who did you beat'? Lose to Ole Miss (no harm there) and Chatt and Citadel and Samford and the best Wofford win is who? Mercer? Would it be Furman if we beat Mercer and end up 4-4 in the league?? I think most people on this board would say a loss to Chatt= no playoffs. I would say that it could depend on how we lose. Go to Chatt in lose on double OT, with OT loss to Cit and 2 point road loss in Samford makes a compelling case but also means no quality wins. We have been excluded in the past (16 team field) with much stronger resumes. If we managed to squeak in with 7-4 record, I wouldn't want to play us in first round game. Love me some IWF! This year's shows have been the highest quality ever, IMO. Appreciate all of the kind remarks. And zero hard feelings about the post game recordings, it is wrong, we know it. HA. We are trying to keep them shorter, but it just keeps happening that there are key plays in the game that need to be shown. But I try my best to keep it at or around 20 minutes. 30 minutes this past week was just a little too long. Thank you for the continued watching of TerrierVision. You can never have too many highlights of beating Furman. TerrierVision wrote: Appreciate all of the kind remarks. And zero hard feelings about the post game recordings, it is wrong, we know it. HA. THE LONGER THE BETTER!!! Get as much GAMETIME as you can!!! GREAT QUALITY! We are the envy of the SOCON!! !